You love blackberries, right? Who doesn’t. But have you ever made a heavenly blackberry BBQ sauce that speaks directly to your primal, foraging side that wants to pick the berries straight from the bush? If you haven’t tried it before, now is the time to start perfecting your skills, after all, grill season is on the way. And you will want to provide others with the fruits of your labor. You will want to pick the perfect blackberries for the best sauce. You can harvest them fresh in season, though most likely you’ll be foraging at the market, or the store. Berries do not post-ripen, so look for ones that are fully ripe with colors of deep purple to black. They should still be firm to touch and plump, ready for a quick rinse and into the pot. You should be consuming blackberries for their high levels of vitamins A and C, along with a whole suite of micronutrients, as well as for their antioxidant potential. Plus, they are reported to be beneficial for maintaining glowingly, healthy skin – we’ll eat to that! As much as we love berries we also adore pork chops, and this combination is hard to pass up. Serve it with some collard greens, or asparagus soup (for a starter) and dinner is good to go. You could also try this mouthwatering blackberry BBQ sauce with a nice salmon filet too – just saying. Melt coconut oil in a saucepan over medium heat. Add the garlic and cook until soft, 2 to 3 minutes. Add all the remaining ingredients to the saucepan except the pork chops, stir and bring to a light boil. Lower heat and simmer 12 to 15 minutes, or until blackberries fall apart. Blend the mixture using an immersion blender or a regular blender. Use a mesh strainer to remove the seeds and bring the sauce back to the pan over low heat. Season the pork chops to taste, and grill the pork chops 5 to 6 minutes per side, or to desired doneness. 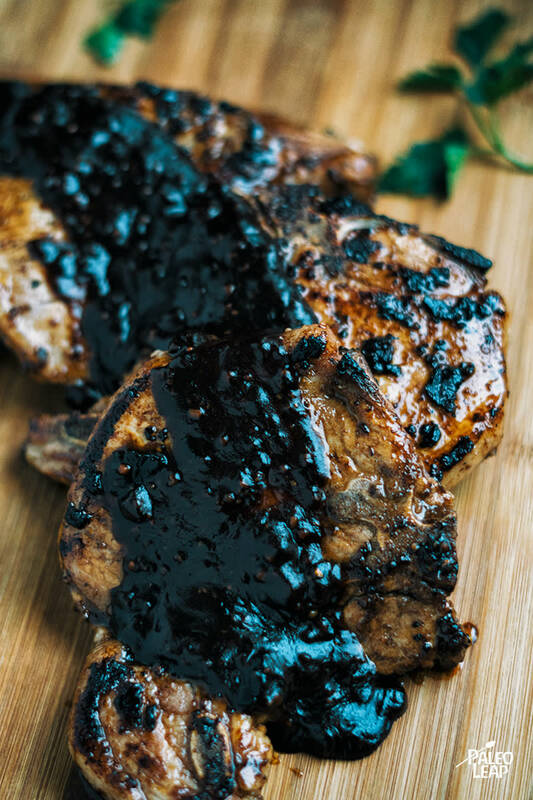 Serve the pork chops topped with the blackberry BBQ Sauce.